(CBS/AP) WASHINGTON — A Federal Reserve survey of business conditions across the United States suggests last month's pullback in hiring may prove to be temporary. The survey released Wednesday showed that each of the Fed's 12 bank districts grew steadily from mid-February through April 2. And the survey noted that hiring was stable or increased in most of the country. The Labor Department last week said hiring slowed in March to half the pace from the previous three months. But the Fed survey, which is anecdotal, didn't reflect that slowdown. The survey noted that job gains occurred in manufacturing, shipping, information technology and professional business services. Businesses expressed concerns about rising gas prices. And retailers in five districts said they were worried that pricier gas would drag on consumer spending in coming months. For now, consumers are still spending, the survey noted. Retail sales increased in almost all districts, the report said. And four districts said the short-term outlook for retail spending is positive. Residential real estate activity improved in most areas, the report said, as developers built more apartments. And banks said that demand for loans is increasing. The Beige Book is released eight times a year and is based on surveys by the Fed's 12 regional banks. There are no numbers in the report. But its findings, which are released two weeks before the Fed's policy meeting, help influence the discussions. When they meet April 24-25, members are expected to stick with their plan to hold short-term interest rates at record lows until at least late 2014. They will likely note the slower hiring pace reported by the government. 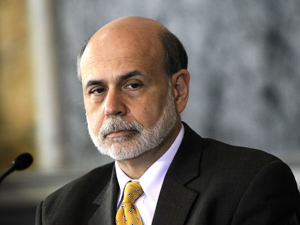 Fed Chairman Ben Bernanke has cautioned that the economy is growing too slowly to maintain recent declines in the unemployment rate. Until last week, the job market looked to be strengthening. Employers added an average 246,000 jobs from December through February, nearly 100,000 more per month that the previous three months. Many economists downplayed March's weak job figures, noting that better winter weather may have boosted hiring in January and March at the expense of later months. The unemployment rate has fallen from 9.1 percent in August to 8.2 percent in March, although part of the drop was because people gave up looking for work. People who are out of work but not looking for jobs aren't counted among the unemployed. Additional hiring has boosted consumer confidence and spurred more spending. Consumer spending jumped in February by the most in seven months. And many large retail chains have reported healthy sales for March. Higher auto sales and rising business demand for machinery and other equipment is boosting factory output. The manufacturing sector expanded in March at a faster pace than the previous month, according to a private survey. But the economy grew at an annual rate of just 3 percent in the October-December quarter. Most economists are predicting growth slowed in the January-March quarter to an annual rate of less than 2.5 percent. Bernanke has said growth normally needs to be closer to 4 percent for a full year to lower the unemployment rate by a full percentage point. He has warned that hiring is likely to slow until consumers and businesses spend more, fueling faster growth. Wages aren't rising fast enough to keep up with inflation. Rising gas prices are also weighing on consumers' ability to spend money on other goods and services. And Europe's debt crisis has flared up again, as Spain and Italy have been forced in recent days to pay higher interest rates on their debts.